"Ike" was our new president, having defeated Adlai Stevenson by a landslide in November 1952, and Russian Premier Joseph Stalin died the following March. And while a truce was signed that summer to stop the fighting in Korea, it seems we're still beleaguered by continuing confrontations with the North Koreans. But back in Chadron (just down the road about 14 miles each of Whitney, the capital of "Greater Nebraska) things seemed to be under control. The Chief of Police in those days was Vernon Storey; I believe he's the fellow on the right in the photo above. Not sure about the officer on the left. Police headquarters was just behind the fire truck bay at the left in this photo. 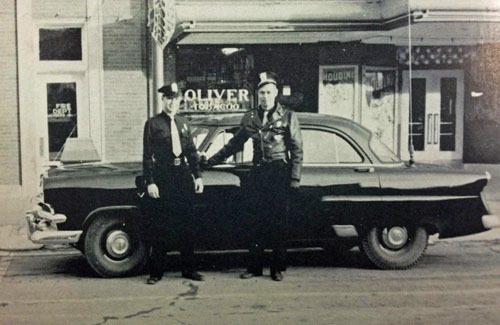 The police seemed to always have one of their "cruisers" parked in front of Oliver's Tobacco shop, which was nudged in next to the Pace Theatre. The cop car seemed always ready for a quick departure, if needed. The movie posters indicate that "Houdini," starring Tony Curtis, was playing at the theatre. I remember watching that movie at the Pace, and I was impressed with Harry Houdini's ability to escape from just about any place. Had he ever spent time in the dank, dark Chadron city jail in the basement of the "Municipal Building," I reckon he would have been out in short order. The building housed not only the jail, Police Department and Fire Department, but almost all city offices. This image brings back memories of the Chadron Junior Police Department. Alas, I don't think it lasted very long, but for youngsters old enough to belong, it was probably a cool gig. The photo also creates more questions. Like, who was Chief of Police just before Storey? Was it Butch Foster? When did Robert Beers become Chief? And was tabaccoonist Hugh Oliver really a retired Navy Chief Petty Officer?